Vicky & George, Denae & Angelo have evolved Vicky's Restaurant into Vicky's Bistro | Wine Bar, fusing timeless traditional Greek and Western cuisine with fresh ideas translating to an innovative new menu. * Exclusive coupons and deals for our events, wine, fine dining and much more! * Stay in touch with one of the greatest bistro in Alberta. * Get tips on food and wine pairing. * Get last minute offers and news from us via push-notifications. * Book reservations inside our app. * Find out about our special events and much much more...! Strong family values are the driving force behind the success of Vicky's, and the Milonas family will continue to strive to provide exceptional cuisine, service and a unique dining environment in a growing and dynamic community! 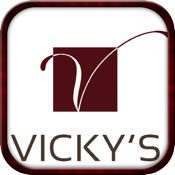 Join us at the New Vicky's Bistro | Wine Bar!